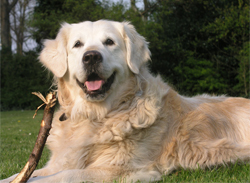 Shop for medications & supplies to prevent flea infestations at VetDepot.com. Fleas live in a variety of environments, but they thrive in humid, warm locations at temperatures between 65 and 80 degrees F. They feed on the blood of dogs, cats, humans, and other hosts every day or two, remaining on their host between feedings. Over time, fleas can cause significant blood loss in animals, which in turn can lead to anemia and other health problems. These risks are especially serious in young puppies and kittens and in already debilitated animals. "Use flea treatments and preventives only under veterinary supervision; some combinations of products are toxic and may cause serious harm to your animal." Because flea bites can cause potentially serious complications in animals and humans and trigger flea bite dermatitis, lead to anemia, or transmit disease, it is essential to the health of your pet and family to deal with fleas at the first sign of a problem. Preventing flea infestations from occurring is easier than treating your animal and home once an infestation occurs. Unfortunately, this is not as simple as placing a simple flea collar on your pet. Keeping fleas away involves treating your animals, home, and yard year-round. 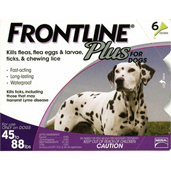 Protect your pet from fleas by using a topical flea control product, such as Frontline Plus or Advantage II, or give your dog Comfortis, which is a daily oral medication. Shampoos and sprays are also available to keep fleas off your pet. Use flea treatments and preventives only under veterinary supervision; some combinations of products are toxic and may cause serious harm to your animal. Also, use extreme caution when applying flea control products. Do not ever use products on cats that are intended for dogs, and vice versa. Set up an area inside your home to inspect animals for fleas and other pests when they come indoors. Ideally, you want a location with good lighting and without carpet. Vacuum your home frequently and pay special attention to areas where your animal spends a lot of time. Wash pet bedding and toys regularly and check for flea eggs and dropping when doing so. If you discover fleas, use a carpet powder to take care of minor problems. Severe infestations may require using a room spray or fogger. If you want to keep fleas from moving into your home, you have to treat outside of your home. Treat your yard as recommended and focus on shady areas and places where your pet spends time, such as under trees and inside dog houses. Clear away organic debris, such as grass clippings and wood, to make your yard less attractive to fleas. Use an insecticide or nematodes and put up a fence if you have problems with stray animals spending time in your yard.